Take Collaboration to the next level, with Clevertouch Interactive Touchscreens. An interactive display company based out of the UK has now expanded their distribution to North America, upper left to be specific. Educators have the opportunity to enhance their digital classrooms and fully immerse themselves into an all-in-one solution. Clevertouch offers an array of touchscreens fully integrated with easy-to-use LUX software and technology simple to us across all grade levels. Whether you’re in the market for finding a budget conscious, user friendly, interactive digital tool within the classroom, or need to upgrade the chalkboard to something a little fancier, look no further than Clevertouch. What does Clevertouch offer that other touchscreens don’t? A lot of the times touchscreens require separate pricing for their integrated/third party software. With Clevertouch everything is included within the price of the user’s touchscreen. This is all backed by LUX software, enabling anyone to enter the classroom and interact with the display. Users can customize screens, enter a white-board like mode, access the internet, and pass-code protect their unit from outside users. 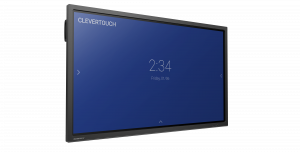 Curious about the models Clevertouch offers? 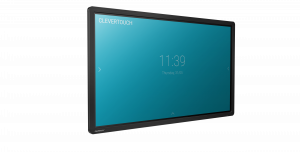 There are two unique series of touchscreens offered by Clevertouch, designed for the education market that offer long term savings and increased return throughout the products life cycle. Starting off with the Plus Series, ranging from 55’’- 86’’ in size and a 4K Ultra HD display. This product line stands out because of its high graphic resolutions, wi-fi enabled, and Clevertstore’s intuitive application store (learn more below) providing high quality vetted applications chosen specifically for educators. The V Series ranges from 65’’ – 86’’ in size and comes equipped with a 4K Ultra HD display. This series in particular is the most bang for your buck, due to less additional features. Yet this shouldn’t steer you away, there is still plenty to offer. V-series features the Snowflake Online Community interface, Clevershare 2.0, remote management, and much more. Is there a feature allowing students to interact with the touchscreen and their personal devices? Yes, managing multiple devices with Clevershare 2.0 has never been easier. 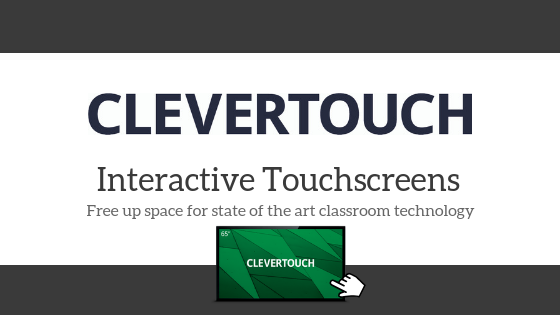 A free application for all Clevertouch products, accessed directly to the Cleverstore. Share content for up to four devices at once and be able to directly see activity being done from the touchscreen directly to each device. Does Clevertouch offer a store to download applications? On top of Clevershare 2.0, Cleverstore offers hundreds of different applications made specifically for these touchscreens, be able to engage your students in immersive learning with a wide range of applications that will best suit the classroom and grade level. Is there an online community for educators to access helpful tips? With Snowflake, an online community made by Clevertouch, educators can share content and lesson plans, and download material to help support one another’s everyday needs within the classroom. If you find yourself wanting to create an application and share it within the community, there is an easy way! Convinced Clevertouch Interactive Touchscreens is the right solution for you? To find out more, check out our website, and view our Clevertouch product line. 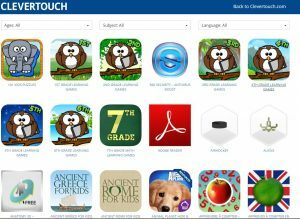 Previous PostPrevious Google Creative Apps for Education – Why these apps will transform the classroom.